U.S. President Donald Trump flanked by Secretary of State Mike Pompeo and White House Chief of Staff John Kelly attend a lunch with Singapore's Prime Minister Lee Hsien Loong and officials at the Istana in Singapore, June 11, 2018. President Donald Trump will leave Singapore Tuesday night after his historic summit with North Korean leader Kim Jong Un the White House said Monday, adding that talks between U.S. and North Korean officials "are ongoing and have moved more quickly than expected." A White House statement said Trump will hold a one-on-one meeting with Kim Tuesday morning, with only translators present, followed by a working lunch and an expanded bilateral meeting that will include Secretary of State Mike Pompeo, Chief of Staff John Kelly, and National Security Advisor John Bolton. The U.S. president will then address the media before flying out late Tuesday Singapore time. Previous reports had suggested Trump would leave on Wednesday. On the eve of the first encounter between a sitting U.S. president and a leader of North Korea, American officials are maintaining any resulting agreement must lead to an end of North Korea’s nuclear weapons and ballistic missile threats. There will not be a repeat of “flimsy agreements” made between previous U.S. administrations and North Korea, U.S. Secretary of State Mike Pompeo told reporters in Singapore on Monday. “The ultimate objective we seek from diplomacy with North Korea has not changed — the complete, verifiable and irreversible de-nuclearization of the Korea peninsula is only outcome that the United States will accept,” declared Pompeo. Sanctions will remain until North Korea completely and verifiably eliminates its weapons of mass destruction programs, added Pompeo. “If diplomacy does not move in the right direction, those measures will increase,” he said. “It’s the case in each of those two countries there are only two people that can make decisions of this magnitude and those two people are going to be sitting in the room together tomorrow,” said Pompeo. He declined, however, to reveal any details of the preliminary discussions being held Monday between U.S. and North Korean officials. But when pressed by reporters, the secretary of state would not say whether or not that could include reduction of the number of or removal of U.S. troops in South Korea. 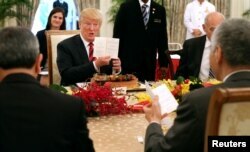 Trump was hosted for a working lunch Monday by Singapore’s prime minister, Lee Hsien Loong, at the Istana, which is the official residence of the city state’s president. Trump was presented with a birthday cake by his Singaporean host. The U.S. president turns 72 on June 14. Trump also spoke by telephone on Monday with South Korean President Moon Jae-in, according to officials in Seoul who predicted that if Tuesday’s Singapore summit is a success it would be a “gift” to the entire world. “President Moon and President Trump agreed Trump and Kim will be able to make a great achievement if the two leaders come together to find a common denominator through frank discussions,” Blue House spokesman Kim Eu-kyeom told reporters. The spokesman said Trump told Moon he would send Pompeo to Seoul immediately after the summit to explain its outcome. The historic handshake between Trump and Kim is to occur Tuesday on the 12-hectare grounds of the luxurious Capella Hotel on Singapore’s resort island of Sentosa. 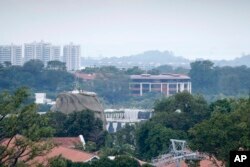 Part of the facade of Capella Hotel is seen in the center of the photo, on Sentosa Island in Singapore, June 6, 2018, ahead of a planned summit Tuesday, June 12, in Singapore between President Donald Trump and North Korean autocrat Kim Jong Un. About 5,000 journalists are in Singapore for the occasion, but only a handful of American and North Korean reporters and photographers will be permitted at the venue when the two leaders greet each other.